I believe this is the first build in the Anidees Ai Crystal on PCPP, and I believe it went really well. If you have any questions, please comment below and I will answer them. Intel Core i7-6700K My CPU and CPU Cooler where the last components I bought. I was going to go with an i5-6600k and Corsair H100i, after looking around, I saw I could get a CRYORIG H7 cooler and a i7-6700 for the exact same price. I just decided to splurge the extra $30 because overall this WILL last me longer than the non-K.
CRYORIG H7 This is the biggest competitor to the 212-EVO, and man must I saw that it looks way better. I haven't ever has my hands on a 212 but it is supposed to cool relatively the same and it looks way better with that plate. EVGA Z170 FTW I came in with some high expectations of this motherboard, and I was kinda let down. I mean it not necessarily their fault for some of these but here are my issues. No USB 2.0 headers; I mean yeah it not their fault I could've easily known that by looking on the spec sheet but it seems like it should've had em. Also, there is a funky yellow LED strip that I am going to be looking into turning off or covering with electrical tape. Finally, I can't use the dust shield because it gets blocked by the GPU, this wouldn't be an issue but its the only 16x slot and I don't wanna go with the slower speed. I also can't see that its only happening because I have a big GPU, I mean the slot is clearly covered by the PCB, its not a tight fit i literally blocks the screw hole. Disappointed and I am going to ask and if an EVGA 1070 would fit with that shield on I might just switch. If not, oh well I'll be fine lol. Corsair Vengeance LPX 16GB DDR4-3200 (2x8GB) Was going through the bios and it clocked my ram at 2133, and I'm like screw that and clocked it at 3200 because I got the ram for that reason lol. Anyway got it for a good price and its really, really fast. Samsung 850 EVO-Series 500GB SSD Reused this from my old build and 500GB is more than enough for everything I need and literally boots in 26 seconds, I'm overwhelmed by it lol. Asus GTX 1070 ROG Strix OC 8GB Really nice looking card and its HUGE, LEDs are a bit disappointing and bleed a lot due to its design, but either way performs really well and its the new pascal card so I just needed to have it because future proofing and OVERKILL. Anidees Ai-Crystal This is a stunning case, the glass makes it look so clear. Cable management room is minimal but works fine, but the one thing I noticed is it seemed like with the stock cables since they are so fat its harder to run the cables to the front, and the lack of cable grameting does not help that. However I got it to work and it looks great, really happy with the turn out, and its the first case I've seen with glass on the front, and it does look really nice. Corsair RM 750x PSU Got this for a snazzy deal on Newegg and is overkill for my needs but it suitable if I decide I want to SLI my 1070s or even move up to a 1080, really satisfied with it. Future Upgrades -LED Kit ; This thing is DARK, and its something I want to see, So an LED kit will help brighten it up. -RGB fans ; To complete the RBG thing and front glass, the LED fans will be a welcome addition and add any color other than being limited to white. 3DMark Scores: Fire Strike: ??? Time Spy: ??? Sorry the pictures are bad, it is so hard to get a good picture of the inside because of how dark it is. i7s are always phenomenal, you just really can't beat them. This is the top of the line for the consumer platform. It does better than my Cooler Master Seidon 120v, an AIO liquid cooler, which says a lot. Current temps are 26C at Idle and 54C at load. Would give it 3 and 1/2 stars if I could. No USB 2.0 headers, no dual 16x slots, funky yellow LED, and not being able to use dust shield when using graphics card in only 16x slot gives it a worse look but overall its a great motherboard. I don't care about dual 16x slots anyway but when the only 16x slot blocks something like that it just makes me mad. Around 30 sec boot time and 500gb makes this perfect fore being the only storage device on my build. There is definitely work to be done, mainly around routing cables to the front, as it seemed there either; wasn't enough slots or ; they were very tight and squeezed my cables. Other than that its a stunning case and great quality from a not as known brand. +1, waiting for those CPU temps. I wanna know how good the cooler is. Ill run some stress tests right now, gonna be honest from first sight, It does better than my 120mm AIO on my other build. Really impressed. 26 Idle and 54 under load, amazed, blows my 120mm AIO out of the water, seriously. Hot damn, I'm sold! Thanks for the reply! Nope, got the K version in case down the line I do want to, but I just don't need to leech the maximum performance out of it, its already overkill as it is. Did you OC with it or no? I am planning on getting a 6600K, and while an i7 should be more intensive, I want to keep all bases covered. 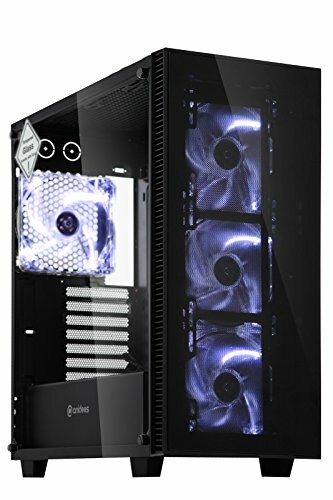 And what a shame, my planned first build will be black/white so it will look great in my opinion :D I'll probably be too busy looking at the build itself than at my screen. Wow, that's better than I expected. I'm definitely buying it. Thanks! The case seems kinda wierd to me, proably cuz there's no drive cages. I like your setup, very clean, and the corner position is cool too. how loud are the case fans? and from what brand? Where can you buy the case? Hey man, did you find a way to turn off that ugly yellow LED strip on the motherboard? I used electrical tape, just covered it right up. It was black tape so it just blends right in. I'm reading that there's a "Dark Mode" in the motherboard's BIOS that will turn it off. Have you heard of it? I'm gonna try it when I receive my board in the mail. I have not heard of it, and it will be hard for me to check, because I already have the electrical tape on, but im gonna hop into the bios right now and look. Yep, can confirm there is a dark mode. When in the BIOS, look under advanced and then Power options. I did not cover up the yellow strip completely, so I could still see a sliver. When dark mode is off, it is lit up, when dark mode is on, it is not. So you should be good if you want to use that. Only thing is, the debug that shows CPU temp will stay on, but i'm sure there's a way to turn that off too if you really wanted. Lol, really nice case and am excited I am the first :P Uploading sick pictures right now, might want to check them out in like 10mins. I was wondering where you bought the cases because for the life of me at this time I cant find any. Newegg and amazon are both out of stock. I don't overclock my CPU's, but you could probably get up to about 4.5/4.6 with this cooler.